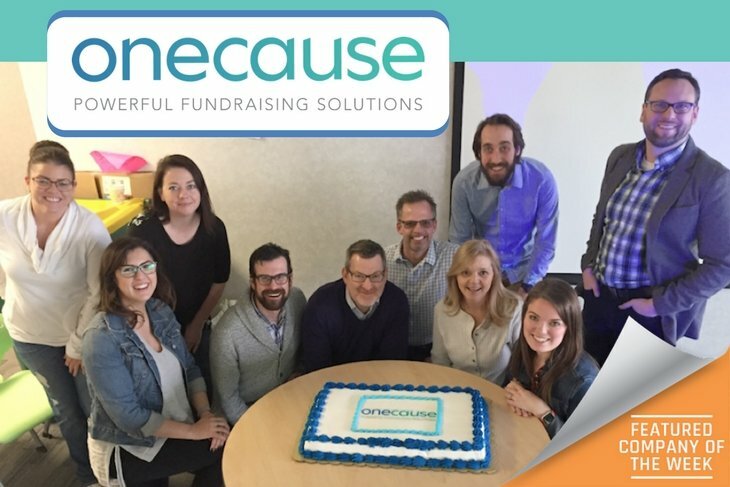 OneCause team members celebrate the company's rebranding announcement, which also marks the 10th anniversary for the innovative fundraising solutions provider. An incredible Indianapolis tech success story started a decade ago when BidPal launched its mobile bidding solution that replaced paper bid sheets for silent auctions with handheld devices and local mobile networks. With more than 13,000 fundraising events and $1.2 billion — you read that right, “billion” — charitable dollars raised on behalf of nonprofit organizations, BidPal has recently rebranded as OneCause and is preparing to launch its newest mobile-first platform including peer-to-peer social fundraising. “The name change from BidPal to OneCause is a natural transition for us that reflects our expanded approach to providing solutions across all of our clients’ fundraising needs,” said CEO Steve Johns. “Over the last several years we’ve expanded far beyond the ballroom where we started with silent auctions. The OneCause name is a nod to the company’s commitment and focused passion with each client — to help each cause amplify its message and raise more funds. The new name also recognizes that the fundraising community shares “one cause,” and that is to build a better tomorrow. Despite record-high total charitable donations rising to $390.05 billion in 2016, according to USA Giving, there is still a great deal of uncertainty in the philanthropy ranks following a tumultuous election cycle, which honestly hasn’t calmed down that much. Donor demographics are changing as baby boomers, the wealthiest generation in American history, prepare to transfer their wealth to their heirs, the millennials. The mobile first platform by OneCause is optimized for the way millennials live, work and play, offers the company a distinct advantage for the future as online and mobile giving both reach critical mass. Coupled with the expected $30 trillion transfer of wealth from boomers to millennials, OneCause is positioned to aid its clients’ fundraising efforts at an ideal cross section of apparatus, platform, preference and means. While peer-to-peer fundraising for individuals has become fairly mainstream with familiar crowdfunding sites like YouCaring, GoFundMe, and even Indiegogo and Kickstarter, the platform OneCause will launch later this quarter is designed as a mobile-first, social enabled organizational tool for charities to share with their donor bases. The power of the new platform really comes in when combining peer-to-peer with fundraising galas. For example, not everyone can write a $10,000 check, but through the new forthcoming OneCause platform, anyone could leverage their own social networks with an easy-to-use, personalized fundraising tool and walk into the gala representing the support of dozens of their friends and family, as well as thousands of very real dollars that have already been collected by the charity. OneCause took the journey to its new brand very seriously. It included working with customers and employees “to really rediscover and reaffirm who we are, what we do, and what makes us unique,” said Johns. “We knew it was important to redefine our core messages and our brand identity to make sure that everything is aligned with the solutions that we were providing to our nonprofit customers. Second Helpings, an organization that is transforming lives through the power of food in Central Indiana, was the beneficiary of more than $10,000 of donations raised using the new, peer-to-peer, social fundraising software from OneCause that will be available this quarter. According to Second Helpings CEO Jennifer Vigran, the campaign raised enough money to provide more than 10,000 meals to local organizations and expanded Second Helpings’ reach into new supporters by way of their social networks. Pictured: OneCause CEO Steve Johns presents a check to Second Helpings. (Left to Right): Katie Prine, Second Helpings senior director of philanthropy; Alisha Roberts, VISTA volunteer; Jennifer Vigran, Second Helpings CEO; Nora Spitznogle, Second Helpings senior director of programs; Kevin Weinmann, OneCause area director; Amber Jett, Second Helpings manager of corporate and donor relations; Steve Johns OneCause CEO.